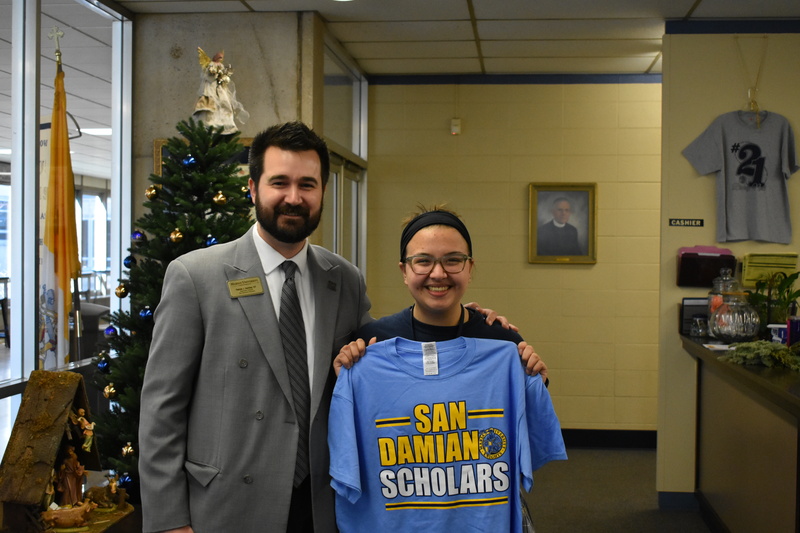 Patrick Verhiley, director of recruiting and marketing San Damiano Scholars at Marian University, surprises Bishop Noll senior Jackie Jania with the news she has been named a San Damiano Scholar at the college in Indianapolis. 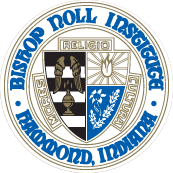 All the hard work has paid off for Bishop Noll senior Jackie Jania who has been named a San Damiano Scholar at Marian University in Indianapolis. 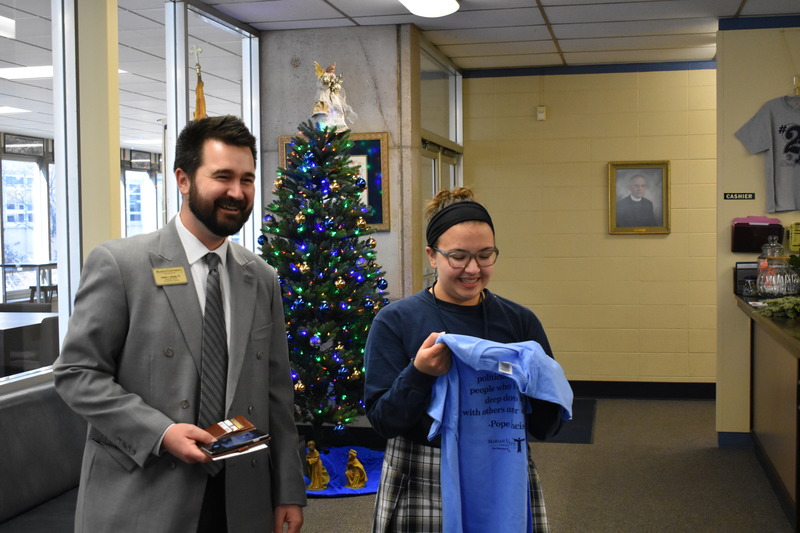 During a visit to Bishop Noll Dec. 12, Patrick Verhiley, director of recruiting and marketing San Damiano Scholars at Marian, surprised her with the good news. Recipients of this honor must be academically inquisitive, sharp, open to God and others, seeking a community of like-minded peers, and deeply committed to servant leadership within their school, church, and community, he said. “Jackie certainly is deserving of this scholarship for all her service and leadership within her school, community, parish, and diocese,” said Verhiley. Jania, of Highland, is involved in many activities and sports at Noll including swimming, band, tennis, cross country, Writing Club, Multicultural Club, Student Council, Campus Ministry and Academic Super Bowl. In addition, she serves as a Student Ambassador. She is also involved with Our Lady of Grace’s Youth Group, Diocesan Youth Council, and Girl Scouts. She became a Girl Representative to the Board for the Girl Scouts of Greater Chicago and Northwest Indiana earlier this school year. She is also in the process of completing the Gold Award for Girl Scouts. Of learning she received the scholarship, Jania said she was speechless. Jania is excited to attend Marian University, saying it is the best mix of everything she was looking for in colleges. She is excited to have a major tied with the San Damiano Program. Jania said many Noll teachers imparted lessons she will take me wherever she goes in life. “Mrs.Albrecht and Mrs. Laird taught me that your voice is important because it is a part of who you are. Mr.Cavazos and Ms. Schmidt helped me understand how important it is to never stop learning about the world we live in. I could name a billion more things about how teachers in this school have influenced my life,” she said. Who: College-aged students who seek to pursue something more during their college years. Students in the San Damiano community participate in annual retreats, monthly service, faith-based internships as well as pursuing a minor pastoral leadership. How: After being accepted to Marian this fall, Jania applied for the scholarship by answering five questions centered around answering God’s call for her life. In November, she visited Marian University for the San Damiano Scholarship interview with 24 other students applying for the scholarship program. What: The $8,500 scholarship is renewable for four years based on the student’s participation in the program. This scholarship can also be stacked on top of other scholarships.